"Macaroni and beef served steaming hot with a delicious assortment of vegetables and seasonings." In a large saucepan, brown the ground beef with the onion, green pepper, and mushrooms; drain. Add corn, peas, stewed tomatoes, crushed tomatoes, tomato paste, tomato sauce, and water. Stir and bring to boil over medium heat. Mix in garlic, parmesan cheese, parsley, salt, pepper, sugar and simmer for 20 to 25 minutes. 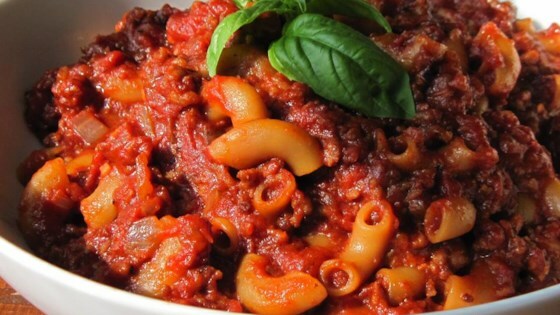 Mix together cooked macaroni and meat sauce. Serve hot or refrigerate for later. My whole family loved this dish, and it was easy to make too. I've found that if you make too much, it's easy to freeze and serve as a quick meal later on.